A possum in the middle… What is it? There really is a big dark stain in our driveway. It’s from black walnut hulls. This is the season for gathering black walnuts (and butternuts too). Black walnuts have thick tough husks covering the nut. The husks contain a strong staining dye and are somewhat of a nuisance to remove by hand. So country tradition is to toss them in the driveway and drive over them for a week or so. As long as you have a fairly soft (gravel or dirt) driveway the car tires remove the husk, but the walnut’s hard shell remains intact. Then we rake ‘em up, hose ’em off, and then let them dry for a few days in the sun. We store them outside on the porch in a well ventilated, rodent proof container, and they will keep for a couple years. The walnut tree is “high as a house.” The nut is indeed “low as a mouse,” and when we crack the shell and look inside at the many chambers we’ll find out there are indeed lots of rooms–more rooms than my house anyway…. But what about the possum in the middle? Let’s get to cracking some of the nuts. We’ll go on a possum hunt, and maybe I can show you a few possums! So now you have your black walnuts dehusked and dry. You can start cracking and eating them right away, but after a few weeks the flavor matures as the nut kernels begin to dry. The kernels shrink a bit and become easier to remove from the shells. But it is the cracking of the nuts that is the challenge. 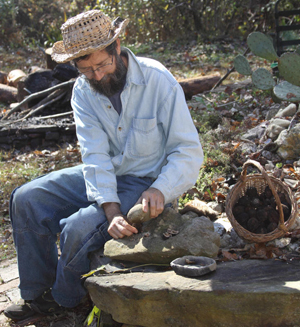 You can do the Stone Age method of hitting the nut with a hammer stone on a “nutting rock” (a large flat rock with a dimple in it to hold the nut). However, a carpenter’s hammer seems to work better than a stone hammer because of the leverage. Hitting the nut on the point seems to work best. Some folks use a vise. Many years ago we ordered the famous lever-action Potter Walnut Cracker, made in Salpulpa, Oklahoma. Picking out the nut meats is still somewhat labor intensive, but using the cracker has increased our walnut consumption considerably. 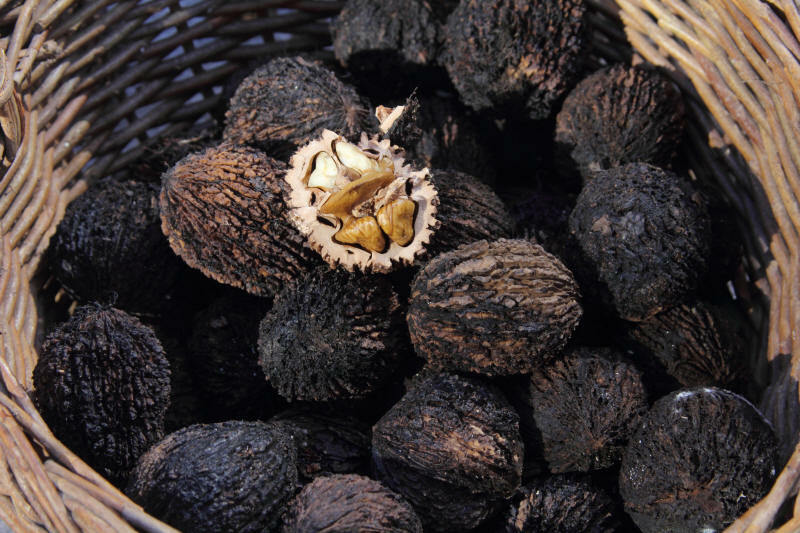 Black walnuts are quite nutritious–high in protein, unsaturated fats, and omega 3 and 6 fatty acids, as well as a large assortment of vitamins and minerals. The nuts can be eaten plain, “right off the nutting stone” as they are cracked. They have a strong flavor, and for some it is an acquired taste. A good way to acquire a taste for black walnuts is to bake them in brownies. They also go well in nut breads. A Cherokee woman once told me they make their winter succotash with hominy and pinto beans sprinkled with black walnuts. Our favorite recipe is to cook homemade sausage, hominy, apple, and black walnuts together. YUM! You can use the husks for a rich brown dye on wool and other natural fabrics. The nut shells can be made into buttons, knobs, and other useful items. Two folks wearing homemade wool hats dyed with black walnut hulls examine the dark trunk of a black walnut tree. The brown and tan wool in these hats was dyed with walnut husks, and the buttons on the buckskin coat and the looped fiber bag are made from walnut shells. …if you want to get cracking on your holiday gift giving, be sure to check out the products page on my website: All kinds of books and recordings “celebrating the natural world.” I could possibly even whip you up a bark basket should you be needing one. Good luck on your black walnut possum hunt! Really enjoyed your site. Havent seen a Potter Walnut Cracker since I was a kid. I love ealnuts bur they are so hard to find. Do you sell them? My daughter asked me how to crack them. I told her with a hammer and a ROCK. I don’t think she had ever seen one cracked. I grew up on a famr and we had walnut trees. As you say, we used the hulls to dye fabric. I trade you raw shelled Mac nuts for your black walnuts 2 for 1. Didn’t have time to gather any before we left West Virginia. I was told by a Civil War reenactor that walnut hulls were used to dye many various Confederate uniform components. Those donning the golden brown cloth were referred to as “Butternuts”.